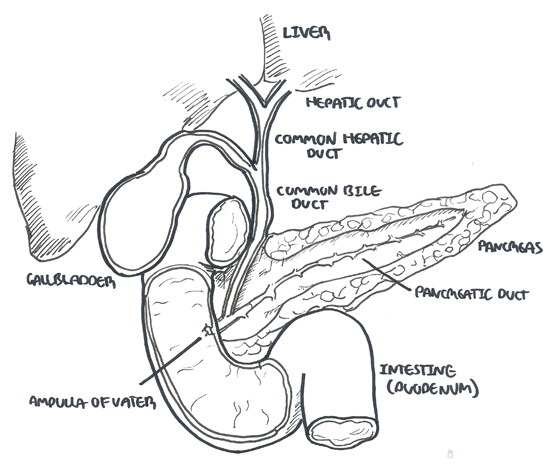 This section looks at gallstone disease in general. For info on cholecystitis specifically click here. Cholangitis: infection of the common bile duct, usually ascending from gut flora. Chronic Cholecystitis: Chronic inflammatory cell infiltration of the gall bladder. Repeated inflammation causes thickening and fibrosis of gall bladder. Cholesterol gallstones occur infrequently in the young and the prevalence increases linearly with age in both gender and approaches 50% at age 70 in women. Rapid weight loss – 50% of obese patients who undergo gastric bypass eventually develop gallstones within 6 months. Morphology Solitary and large Usually multiple, faceted (calcium salts, pigment, and cholesterol) Small, friable and irregular. Black or Brown. Causes and risk factors Female, Age, Obesity and Admirand’s triangle Black pigment stones associated with haemolytic disease. Brown pigment stones associated with hereditary spherocytosis and malaria. Admirand’s triangle: increase risk of stone if decrease lecithin, bile salts and increase cholesterol. Asymptomatic (75-90% of cases) Gallstones that do not impact do not cause any symptoms. Majority of people have stone that stay in the gallbladder or are to small to cause any problems. Courvoisier’s Law: The presence of jaundice, palpable gallbladder means that the jaundice is unlikely to be due to stones. It is tumour of the head of the pancreas until proven otherwise. Investigations Check FBC, EUC, blood culture, serum amylase and lipase (in acute setting), LFT and serum glucose. Abdominal X-ray can reveal 10% of calculi (radio-opaque calculi). Ultrasound is the procedure of choice as it identifies stones, determine wall thickens and assess ductal dilatation. HIDA scan is useful when ultrasound findings are equivocal. Initial management is conservative: nil by mouth, IV fluids, opiate analgesia. Surgery is treatment of choice. *Asymptomatic patients with gall stones at risk of complications (diabetics, porcelian gall bladder, history of pancreatitis, long-term immunosuppressed). Management Non-Surgical treatment include percutaneous drainage of gallbladder and dissolution or shock wave lithotripsy which is hardly used. Mucocele: stone in neck of gall bladder; bile is absorbed, but mucus secretion continue producing a large, tense globular mass in right upper quadrant.